SAM tungsten alloys are generally used by aerospace designers for balancing components or reducing vibration. 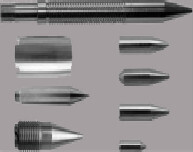 The high density of tungsten materials allows maximum sensitivity from optimum mass and is particularly valuable in situations where a large mass has to be contained in a confined space. Tungsten counterweights are designed into a propeller fail-safe system to prevent overspeeding. Rotating parts in gyroscopic controls are often made from tungsten material because of its high angular momentum. These applications are typically found in avionics and missiles. Tungsten weights have been used to deaden vibration in applications including control sticks and riveting tooling. The same principle is used to increase passenger comfort by reducing vibration within the body of the aircraft - this is especially valuable in turboprops and helicopters.